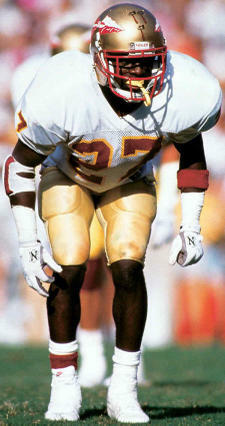 But for FSU fans in the late 80's, Terrell Buckley (1989-91) is best remembered for a single play. Fielding a punt against Syracuse in the Carrier Dome, he tucked the ball under his arm and took a casual step or two towards the bench. Defenders slowed down. Obviously Buckley had signaled for a fair catch. NOT. T-Buck suddenly burst down the middle of the field, picked up a key block and raced 69 yards to paydirt. The crafty move shocked everybody in the Dome -- even his coaches. "I wish I could have thought that up," chuckled Bobby Bowden, who promptly dubbed Buckley "The Foola from Pascagoula." Here's how that unforgettable punt return sounded if you were listening to the play-by-play in October of 1989.